In this post, I will show you the new version of my tool PS1 To EXE generator that allows you to generate an EXE file from a PowerShell project, choose the main ps1 and inlude other files and folders. The EXE file is an SFX archive build with WinRAR meaning Winrar is required. Your EXE may be connsidered as a Trojan by your antivirus. In fact it's false positive report. The tool is now composed of two parts. The second part will check if Winrar is installed or not. 2 / Select your PowerShell project. This project should be the folder containing your PS1 file. 3 / Type the name of the EXE. 4 / Choose the main PS1 file that will be run after running the EXE file. 6 / Click on the Build the EXE button to create your EXE. 7 / Once it's done the below message appears and your EXE file will be created in your Desktop. In the EXE configuration part, the Requires admin rights CheckBox allows you to ask or not admin rights after running the EXE. 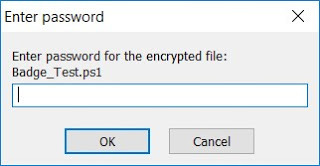 This function allows you to ask for a password after running the EXE. Click on the More options button in the title bar, as above. In the Add parameters to your PS1 TextBox, type the parameters to add. Don't forget to type with "-"
- I want to build an EXE to run a PowerShell tool.